A county commissioner’s job has a steep learning curve and new lessons are experienced daily. That is District Two Commissioner Karen Keith’s assessment of the job she started three years ago. Now, as she starts her fourth year and prepares to run for a second term in 2012, Keith said that not only has the job been a welcome challenge, it also has been fun to represent people in her district. 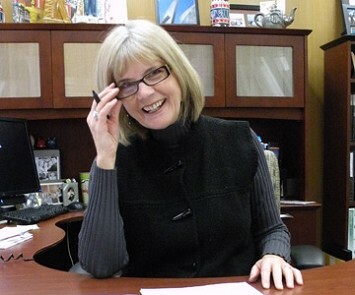 As a group, the Tulsa County Commissioners work well together,” she said. That cohesiveness has been important because 2011 was a tough year. Despite the economic difficulties, no county employee was laid off. “We run a lean, mean machine in Tulsa County,” Keith continued. Tulsa County did very well during 2011 and was able to complete a variety of road projects. Keith said she also was very pleased that Tom Rains was selected as county engineer and was able to tackle the job that was opened by Ray Jordan’s retirement. Looking specifically at District Two, Keith said she made maintenance and improvements of roads and bridges a top priority. Crews worked tirelessly on Avery Drive during the construction season to mill out the old road to its base, repair the base and resurface it and upgrade the guard railing bordering the road. In addition, a major upgrade to the infrastructure was completed for the 51st Street and 65th West Ave.
Old North Road in Sand Springs received a new overlay that will prepare the way for completion of the project to Triangle Park. County crews also completed work on an 81st Street intersection near the school, re-decked three bridges and through interlocal agreements began work on several area parking lots. Work on key elements of the Jenks/Haikey Creek Levee system kept Tulsa County out in front of flood control work in Jenks. In addition to completing a video inspection of relief wells within the system, the County also updated the main pump station for the levee, Keith said. The County was responsible for inspection work of the draining aspects for the Village on Main project that included the road going over the levee. Crews also completed four mowing cycles throughout the year while working specifically to clear timber and debris for the South Lakes addition. Redistricting based on the 2010 Census data required a major accomplishment for the future of District Two road maintenance and improvements, she said. Previously, the District’s geological boundaries were a hurdle to efficient operation during ice and snowstorms and for mowing and debris clearing. The new boundaries should make this work more efficient. “Snowpocalypse 2011” brought new challenges for District Two crews, Keith said. Between the two major snowstorms, crews treated approximately 1,000 miles of roadways, used, 1,114.5 tons of sand and 21.5 tons of salt to treat the roadways. “The accomplishments of my team are made all the more impressive because they did the work with two graders, two large plows, one small plow and five sand trucks,” said Lewis Long, District Two highway maintenance superintendent. Neighborhood cleanup projects were another of Keith’s priorities. County resources were utilized to assist with neighborhood cleanup efforts. The Mayfair neighborhood received help not only from the district, but also from the Tulsa Shock women’s basketball team. A second project was the cleanup activities near the former Jane Addams Elementary School. Area cleanup efforts were enhanced when the county was able to contract for a major building demolition at 65th West Ave. and Charles Page Blvd. Work on the Juvenile Justice Center continues as funding efforts are sought to help fund the project. “We have continued a dialogue with various components of the Family Court System and other support agencies to develop a comprehensive picture of what the facility will include,” Keith said. “In the interim, the County has installed a fire suppression system in the existing facility. Park improvements also were made during 2011. Chandler Park Community Center saw a major improvement through the installation of an array of solar panels to help generate electricity for the facility, she said. The approximately $3 million project was completed with the help of grant money from the U.S. Department of Energy. The program already has begun to pay dividends by qualifying the County for rebates through PSO’s Model Cities Program of $175 per kW of peak demand reduction and $0.06 per kWh of first year energy reduction, resulting in an initial savings of $7,000 to $10,000 annually. An extensive amount of work has been done with the Tulsa County Drainage District 12 to maintain and improve the operational efficiency of that district, she said. The effort was made in an effort to stay out in front of flood issues in the west Tulsa area. District 12 is faced with post-Katrina flood mitigation standards that are far stricter than in past years. Underscoring the seriousness of the situation, the U.S. Army Corps of engineers deemed the Tulsa and West Tulsa levee system “unacceptable” which placed it at risk of decertification and de-enrollment from the National Flood Insurance program. Commissioners unanimously named Todd Kirkpatrick as levee foreman, Keith said. Kirkpatrick already has begun a pilot inspection program that will put the levee system well on its way toward a better understanding of what that system needs to stay in compliance with FEMA’s regulations while west Tulsa business and citizens for the next 60 years of its life cycle. Burn bans were common because of hot, dry weather during 2011, Keith said. The existing statute and information collection process generated confusion amongst area fire chiefs as to whether they should vote for a burn ban despite agreeing the County needed to have one in place.